Turn-key Treatment Plans solves the problem this way. Calculates patient’s out-of-pocket and balance remaining. How much information do I get? This image is a typical Real Time Eligibility (RTE) response (271) from Met Life, one of the more informative payors. Turn-key Treatment Plans sends this next image electronically and stores the details in the database. Where do the benefits appear in the treatment plan? In this image, insurance benefits appear in the treatment plan located to the right and below the restorative chart. 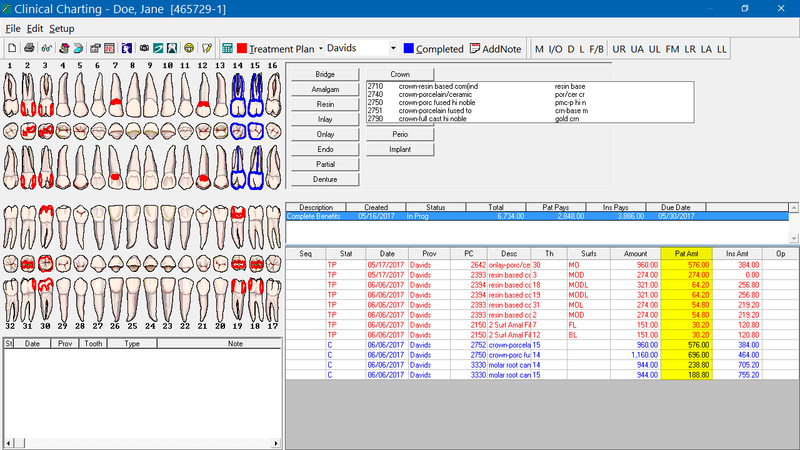 Electronic Transaction Solutions collaborates with BRS Dental Software to provide Turn-key Treatment Plans. ETS is responsible for investigating the available benefits based on an electronic query from BRS software. Dental Office Manager from BRS, searches through the Scheduler for appointments where the patient has dental insurance. DOM sends electronic queries to ETS that contain patient’s demographics and dental insurance plan information. The research product is returned to DOM via a web service that includes data and the (HTML) document –pictured above. The data is saved in the patient’s database records and the document is stored in the patient’s database folder. The provider is able to print the treatment plan when needed.